This is a yummy little dessert made last night after being inspired by my good friend Malini’s blog. I used an assortment of pots, two of the small ones as in the picture, normally used for olives etc. and three larger 250mL capacity pillyvut porcelain dishes I somehow managed to inherit from Grandma. That lovely lady had good taste. So all of these went into a large baking dish half filled with hot water. For the recipe see the link above. The puddings are buttery and light with a sticky golden syrup base that you can tuck into or avoid, depending on how much sweetness you feel like. I haven’t turned them out as they looked so pretty as is. I did test one though and with a quick whip around the edge with a blunt knife, and an inversion onto a plate came out very easily. 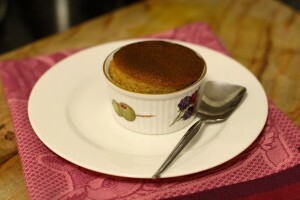 This is a Jill Dupleix recipe from ‘Old Food’, and a very nice one at that. This entry was posted on Tuesday, May 19th, 2009 at 10:27 am	and is filed under Dessert, Recipes. You can follow any responses to this entry through the RSS 2.0 feed. You can leave a response, or trackback from your own site. Gee, glad you enjoyed it! Entries (RSS) and Comments (RSS). 32 queries. 0.230 seconds.